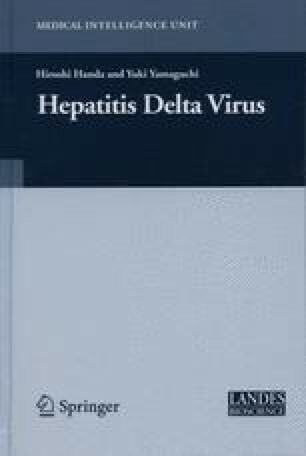 Hepatitis delta virus (HDV) is a defective virus that requires hepatitis B virus (HBV) surface antigen for virion assembly and infection,1 and contains a negative single stranded circular RNA genome of 1.7 kilobases.2,3 HDV is classified into three geno-types (genotype I, II and III) based on genetic sequence analysis (Fig. 1).4 Genotype II shows approximately 75% homology to genotype I, and genotype III shares about 60 to 65% homol-ogy with genotype I and II. There are many variants within each genotype. Especially, HDV genotype II is further divided into two types (i.e., Ila and lib), with 77% nucleotide homology between the complete sequences of genotype Ila and lib.5 The nucleotide homology between genotype lib and Ilb-M, the newly identified lib variant, is 88–90%.6 Similarly, Ila variant was recently found in Siberia (Ila-Yakutia), which in comparison with Ila shows a similar degree of genetic differences.7 These genotypes show different geographical distributions and clinical pictures, which is thought to be caused by functional differences of genotype-specific sequences of HDV-RNA as well as HDAg protein.